Devonte Graham’s senior season has been slightly overshadowed by the supernova that is Trae Young’s freshman season. Still, Graham has been superb this year and is spearheading Kansas’ push for their 14th straight Big 12 regular season crown. Graham is 3rd in the Big 12 in scoring at 17.5 PPG and 2nd in assists at 7.4 APG. When Graham is on the court, he’s assisting his teammates on 32% of possessions, which is good for 5th in the Big 12 and just outside the top-50 nationally (53rd). Let’s break down who Graham is assisting when he’s on the court. Luke Winn, formerly of SI, used to do great pie charts on a player’s assists in his Power Rankings column (here’s an example). Let’s do the same. Here is the breakdown of whom Graham is assisting most frequently this season (assist stats courtesy of Synergy Sports). The top 4 in order are Svi, Azubuike, Vick, and Newman. This isn’t a surprise as that order is the same order as the scoring average for those four guys (16.4, 13.9, 12.8, 11.8). I was a touch surprised by two things though. First, I’m surprised that Azubuike is trailing Svi by a full 5 percentage points. When you watch Kansas, it just feels like it’s Graham who is constantly feeding Azubuike on those post entry lob passes and alley-oop passes to the rim. That might be the case, but he’s assisting Svi far more often. Second, Graham assists Vick twice as much as Newman despite the fact that those two have just one point separating their PPG values — 12.8 to 11.8. You know how it feels like Graham delivers about five lobs per game to Vick? This data backs that up. Outside of Graham, Kansas’ three best 3-point shooters are Svi, Newman, and Vick. 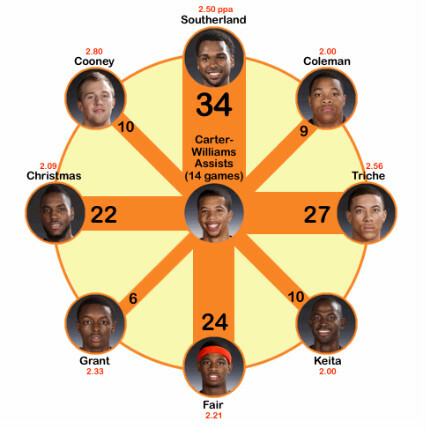 Here is the breakdown of how many of their 3-pointers come on assists from Graham. Svi relies on Graham finding him much more than Newman and Vick do. When you see Svi knocking down those wide-open corner 3’s, it’s probably coming off of a dish from Graham. Devonte Graham probably isn’t going to win Big 12 Player of the Year. Don’t ignore his play thus far, though. He’s been terrific for the Jayhawks and is sometimes the only guy Bill Self truly trusts — he’s played 98% of minutes in Big 12 play, first in the conference. Graham will be represented on an All-American team at the end of the season. One thing I really like to do is compare the offensive and defensive profile of a team to similar teams in recent years. Recently, I noticed the similarity of Texas Tech and Cincinnati this season. Per Kenpom, Texas Tech is currently 57th in Adj. Offense and 3rd in Adj. Defense. Cincinnati is 55th in Adj. Offense and 2nd in Adj. Defense. How do teams like these typically fare in the NCAA Tournament. This table shows teams with similar profiles since the 2011 seasons. These teams all had top-5 defenses and offenses ranked between 50th and 80th nationally. If you’re a Texas Tech or Cincinnati fan, you look at this table and have to be at least a little concerned. There’s only one 2nd weekend team in the bunch, and that’s 2015 Louisville, who had two NBA players in Terry Rozier and Montrezl Harrell. I’m not sure if there are any surefire NBA players on either Texas Tech or Cincinnati. There are some definite flameouts on this list as well. That 2013 Georgetown team is the one that lost to Florida Gulf Coast. Louisville lost to a 13-seed in 2011, Wisconsin lost to a 12-seed in 2013, and Virginia scored 39 points in 2017 while getting absolutely destroyed by Florida. The most concerning thing about this list is how these teams lose in the NCAA Tournament. None of them have lost because their defensive strength suddenly becomes a weakness in one game. They lose because they have a game where their offense predictably struggles. Here are the PPP (points per possession) for each NCAA Tournament loss by these teams, starting with Virginia in 2017: 0.65, 0.89, 0.97, 0.74, 0.89, 0.87. That’s an average of 0.84 PPP. There’s not a single game in the bunch where one of these teams reached 1.00 PPP in their season-ending loss. The weakness eventually catches up with them. Now, why should Texas Tech and Cincinnati be encouraged? Well they both have the two best offenses on this list of teams. They both average about 113 points per 100 possessions while the other six teams had a combined average of 110 points per 100 possessions. Those 3 points per 100 possessions could make all the difference in a close game in March. This is just something worth monitoring in the last month of the regular season. Can Texas Tech make strides on offense? They’ll need to if they want to seriously contend for a Final Four. Let’s update the Big 12 conference standings in West Virginia’s section this week. Currently, the Mountaineers are 7-4 in conference play, just one game back of both Kansas and Texas Tech. That’s not awful but not exactly where West Virginia wants to be. I’d argue their current position is even better than it looks. Let’s reexamine the conference standings using the Tim Floyd method, which I first wrote about in this edition of the Power Rankings. Despite being one game behind Kansas and Texas Tech, West Virginia is actually tied with those two teams using the Tim Floyd method of counting road wins as 1 point, home losses as -1 point, and everything else as 0. Because teams have played 11 conference games at this point, there’s some schedule imbalance at this point. West Virginia has 4 home games and 3 road games left on their conference schedule. Kansas and Texas Tech both have 3 home games and 4 road games left. This gives West Virginia more than a fighting chance at claiming at least a share of the conference title. If the Mountaineers take care of business at home and steal one or two wins on the road, they could call themselves Big 12 regular season champions. Kenpom currently projects Texas Tech and Kansas to both finish the regular season at 12-6 and has West Virginia finishing 11-7. If West Virginia can win 1 or 2 of their last 3 on the road, they’re not going to finish 11-7. Those final road games at Kansas, Baylor, and Texas will be huge in determining the conference champion (especially the Kansas game). Oklahoma is often talked about as a Final Four contender, largely because of the incredible impact of Trae Young. When I watch them play and look at their statistical profile, I wonder if that should be a commonly held viewpoint, because their defense looks worse and worse as the season has progressed. Per Kenpom, their Adjusted Defense is now 89th in the nation. Just a month ago, on January 4th, they were 40th in Adjusted Defense in Kenpom. Let’s do the same exercise with Oklahoma that we did with Texas Tech above. Who are the teams in recent years with profiles most similar to Oklahoma and have those teams had success in March? This table shows teams with offenses ranked between 10-20 and defenses ranked between 80-100 since the 2011 season, per Kenpom. Yikes. Not a single second weekend team in the bunch and only one that won a single NCAA Tournament team. Now, there’s a major difference between Oklahoma and every team on this list, and that’s Trae Young. He’s a top-5 draft pick who is leading the nation in both scoring and assists, which has never been done before. If you drop Young on any one of these teams, they probably don’t lose in the 1st round (they also would probably have an even better offensive efficiency). Every single one of these teams has lost their final game of the season due to being unable to get stops. Here are their PPP allowed in their season-ending losses, starting with Baylor in 2016: 1.18, 1.02, 1.11, 1.17, 1.04, 1.25. That’s an average of 1.13 PPP. On offense, those teams averaged 1.00 PPP exactly. So their defenses couldn’t get stops, and their offenses weren’t quite good enough to overcome their poor defense. These aren’t top-5 offenses that could potentially survive that type of poor defense. Much like Texas Tech needs to improve its offense if it wants to make the Final Four, Oklahoma needs to improve its defense. It can’t have the 89th ranked defense in the country. It has to get back into that 40th range like they were a month ago. They need to be able to make stops if they want to make a serious run in March. I’ve written about TCU’s great offense and struggling defense a few times this season. One stat that shows the divergence between those two ends of the court more than anything is their eFG% (effective field goal percentage) and their opponents’ eFG%. TCU currently has an eFG% of 57.4%, which ranks 13th nationally. Their opponents currently have an eFG% of 53.1%, which ranked 271st nationally. That’s an insane discrepancy. Guess what? I’m in the mood for some more team comps! Here are similar major conference teams since 2011 that had a top-20 eFG% and a defensive eFG% outside of the top-200 nationally. First, this type of statistical oddity for a team was much more common than I thought it would be. Second, this is now the third “similar team exercise” I’ve done this week that doesn’t look too great for a Big 12 team. There’s only one 2nd weekend team in this bunch, last season’s Michigan squad that went on a magical run through the Big Ten Tournament and first weekend of the NCAA Tournament. Otherwise, it’s a lot of 1st round tourney exits. I discussed this during the Oklahoma section, but this type of imbalance isn’t sustainable if you want to achieve real success in March. TCU has to find a way to make it more difficult for opponents to shoot so well from the field, which will then translate into stops, especially considering how good they are at grabbing defensive rebounds — their opponents grab just 25% of their own misses, which is the 47th lowest rate nationally. If TCU can improve their 2-point FG defense and prevent opponents from taking so many 3-pointers, I’ll consider them as a possible second weekend sleeper in the NCAA Tournament. If they don’t, they’ll likely be looking at an early exit. Want to see something that is both surprising and slightly alarming for a Kansas State team under Bruce Weber? Look at the Wildcats’ offensive rebounds and defensive rebounding in conference play this season. Kansas State is currently last in the conference in both offensive rebounding and preventing opponents’ offensive rebounding. That’s not what you would expect from a hard-nosed, tough Kansas State teams, right? That’s the typical narrative around Bruce Weber teams — they play hard and tough and physical. Is that actually true, though? Here’s their conference-only offensive rebounding stats under Bruce Weber since 2013 (I’m showing both their rebounding rate and their conference rank here). It’s now been two straight years in which Kansas State’s offensive rebounding rate has declined after a Bruce Weber coached Kansas State high in 2016 of 37% in Big 12 play. This program is relying less and less on offensive rebounding to survive during the conference season. Here’s their opponents’ offensive rebounding rates in that same time period. From 2013 to 2017, K-State was about as consistent as possible, allowing opponents to grab just one-third of their own misses during Big 12 play. Despite that consistency, they never ranked particularly high among Big 12 teams, as they were in the top half of the conference just once in 2015. This year, they’re allowing opponents to grab offensive rebounds 37% of the time in Big 12 play. It’s been quite the stark drop-off considering past consistency. So Kansas State teams were once quite effective at grabbing their own misses, which fits the physical narrative that is applied to them. This season, that is not the case. The Wildcats have never been THAT good at defensive rebounding in Big 12 play — they’ve essentially been league average or slightly worse. If they don’t fit their usual narrative, does that even really matter? I’d say no. There is more than one way for a team to achieve success. This team is built on being the best offense ever under Bruce Weber at Kansas State and currently the best shooting team in the Big 12 — they lead the Big 12 in eFG% during conference play. If you’re watching a Kansas State team over the next few weeks and hear them being described as a hard-nosed, physical team who rebound like no other, remember this data. That’s not the case this season, and it really wasn’t the case last season either. Is Shaka Smart a good offensive coach? I know he’s considered one of the best young coaches in the country, but I’ve yet to see any real promise as Smart having an offense that can be relied upon consistently. Texas currently has the 124th best offense in the nation, which is abjectly poor for a team with the recruiting talent that they have. Look at Shaka Smart coached teams since he became head coach at VCU in 2010. Take a look at that AdjO column. There is one top-25 offense there, in 2013. At Texas, he’s had two non-top 100 offenses with players that were recruited primarily by him rather than by previous coach Rick Barnes. Teams consistently shoot poorly and don’t share the ball. The latter point there is more concerning to me. At Texas, his teams’ assist rates have been in the 300th range nationally (out of 351 teams). At VCU, his teams hovered around the 200th-225th range most of the time. His major outlier was the 2011 team, which reached the Final Four and assisted on 60% of their field goals made, good for 40th nationally. This is now a clear and obvious trend. His teams don’t share the ball well. Per Synergy Sports, Texas possessions end with 4 seconds or less left on the shot clock 7.5% of the time, which leads the Big 12 by a full percentage point. The next closest team is Oklahoma State at 6.5%, and most teams are in the 4-5% range. Having the shot clock run down that frequently is indicative of an offense without a coherent plan. Too often, Texas possessions are nearly unwatchable for the first 20 seconds and then turn into a high ballscreen action with Matt Coleman being forced to create something out of nothing. Last season, this responsibility often fell on Kerwin Roach, and it showed in his advanced stats — his Offensive Rating was just 92.2. This season, Matt Coleman has that responsibility and his Offensive Rating is just 96.5. That’s not a coincidence — these Texas PGs are being put in positions where they will not succeed consistently. It’s also not a coincidence that Kerwin Roach’s Offensive Rating has climbed to 106.3 this season as he’s playing off the ball and isn’t forced to make something happen out of nothing with five seconds left on the shot clock. I’ve written often about Texas’ poor shooting. It’s difficult to have a great offense when you can’t make shots. Still though, their offense shouldn’t be THIS bad. Shaka Smart has to figure this out this offseason; he can’t have another team at Texas that struggles scoring this damn much, not when he’s getting top-10 recruiting classes each season. Share the ball. Don’t let the shot clock get below 10 so frequently. Have some sort of a plan on that end. It has to be better at some point. Sites like Kenpom and barttorvik.com have a way to quantify luck, which could also be described as success (or lack thereof) in close games. This season, Baylor is the Big 12 team who has had truly bad luck. In Kenpom, Baylor is ranked 330th out of 351 teams in “Luck”. At barttorvik.com, they are ranked 279th. At both sites, they are have the worst luck in the conference and among the worst luck among major conference teams. Of their seven Big 12 losses, Baylor has lost four of them by 12 combined points. They were up 4 points with 4 minutes to play at home vs. TCU before losing in overtime. They were tied with West Virginia with two minutes to play in Morgantown before losing by three. They were up 67-61 with three minutes left and the ball in their hands at Kansas. Their win probability at that point was over 90% (see win probability chart below). They lost by three. At Oklahoma, they were up 93-89 with the ball in their hands with just under three minutes to play. Their win probability was just under 85% (see that chart below as well). They lost that game by three. Right now, Baylor still has hopes of making the NCAA Tournament. They are 14-10 overall and 4-7 in league play. They have four home games remaining, and all four represent opportunities for huge wins as they play Kansas, West Virginia, Texas Tech, and Oklahoma. If they grab some wins there, they could make the NCAA Tournament. Can a team with “bad luck” make the NCAA Tournament? In the past, has it happened? Last season, the NCAA Tournament team with the worst luck was the Big 12’s own Oklahoma State, who were 324th in Luck, per Kenpom. In 2016, Vanderbilt made the NCAA Tournament despite having the 6th worst luck in the nation, ranking 346th nationally, per Kenpom. Texas made the tournament in 2015 with a “Luck” ranking of 329th. So it is possible for Baylor to survive the stroke of bad luck they’ve had so far this season. Teams have done it before. Ultimately, it will come down to those four home games. They’ve got to record some wins there, and if it requires some luck to go their way, I’m sure Scott Drew will take it. Sometimes, a player will turn pro before most of the media or his schools’ fanbase thinks he should. Fans often complain, oddly turning against the player who has provided joy and entertainment to those same fans over the last 1-3 years. Sometimes, a player comes back to school and everyone rejoices. And sometimes, that player shouldn’t. Take a look at Jeffrey Carroll’s senior season for that example. Last season, Carroll flirted with the idea of turning pro, as he entered his name in the NBA Draft before coming back to school at Oklahoma State. Carroll probably should have stayed in the draft. There are no guarantees he would have been drafted in the first round, but I’m fairly confident he would have at least been a 2nd-round pick. Now, I’m not sure Carroll even gets drafted this season. Look at his performance this season compared to last season (click on below image to expand in new tab). His numbers are down across the board. He’s shooting much worse on both 2-pointers and 3-pointers. He’s turning it over more. His Offensive Rating has plummeted from 130.4 (12th in the nation) to 101.9 (55th in the Big 12). If he would have turned pro last season, there would have been some mystery to his potential as a ball-handler. Could he be a playmaking guard who can run pick and roll? Now, there’s no mystery. He just can’t. He ranked 39th out of 42 Big 12 players in PPP in pick and roll situations, per Synergy Sports. I’m not trying to insult the guy. It’s okay to be a spot-up shooter; many guys have made a living being a 3-and-D guy in the NBA. It’s just now scouts know that’s all Carroll can be though; there is no more intrigue. This section is basically just a *flashing lights* reminder for fans to never criticize their players for turning pro whenever said players want to turn pro. Their stock might never be higher. Thank them for what they’ve done for your university and wish them the best. The above screen snip shows the top-30 home court advantages, which includes a variety of metrics. The important think to note is the values are based on differences between home and road games. So for the Kansas fans wondering how Allen Fieldhouse isn’t in the top-30, blame Bill Self for making his team so damn good on the road. If you’re good on the road, it’s much less of a “road court disadvantage” to play away from home. When you look at Iowa State’s PPP performance on both offense and defense in home games vs. road games, being #1 in Kenpom’s Home Court Advantage metric makes a ton of sense. At home, Iowa State scores nearly 0.20 more points per possession and allows 0.11 less points per possessions. They scored 1.46 PPP in a home game vs. West Virginia and allowed 1.48 PPP in a road game at TCU. Those two games happened two weeks of each other. That’s absurd. Now a lot of this is due to youth and inexperience. When you have a young team, they seemingly will always play better at home compared to away from home. They’re more comfortable, they can feed off the positive energy, they can hear the instructions from Steve Prohm more easily. Even with all that, and with my background and general adherence to respecting data and reason, it is fun to chalk some of this up to the mythical Hilton Magic. That building continues to be one of the best environments in the country, and fun, weird things just seem to happen there. I mean, there’s really no reasonable explanation for Iowa State losing at Texas Tech by 18 but beating that same Red Raiders team by 18 at home. A 36-point swing is wild considering the quality of this Texas Tech team. Texas Tech, who prides themselves on their defense, which is ranked 3rd nationally, allowed 1.11 PPP to a 7th ranked Big 12 offense in Ames. In all other Big 12 games, the most PPP that Texas Tech has allowed in a game is 1.05 to Texas in Austin. Teams have scored more than 1.00 PPP in just 5 of 11 Big 12 games. Yet that Texas Tech defense gave up 1.11 PPP in Ames. Chalk one up to Hilton Magic. Iowa State still has Kansas, Oklahoma, TCU, and Oklahoma State left on their home schedule. Do not be surprised to see Kansas or Oklahoma go into that building and lose. Imagine how happy Iowa State fans would be if their last-place team could knock Kansas out of first place next Tuesday. Crazier things have happened in Hilton.